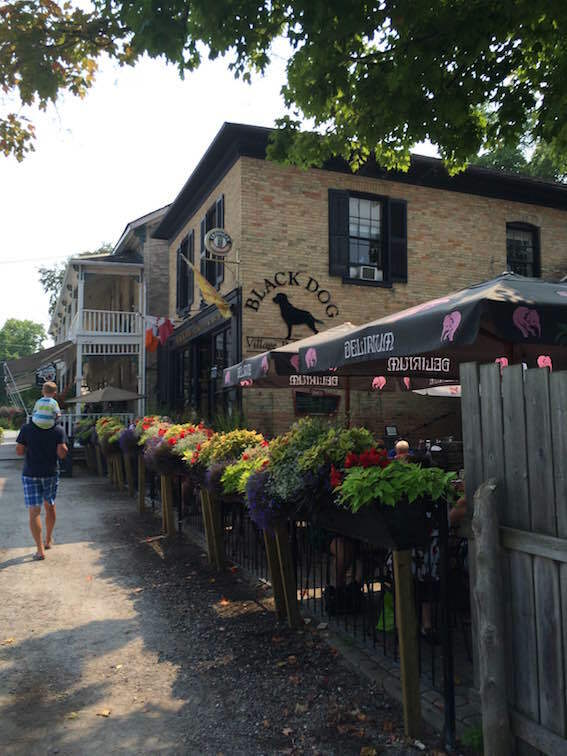 BAYFIELD – Even though the last long weekend of summer has passed, there is still lots of summertime fun to be had in Bayfield. I am always surprised with all that there is going on in Bayfield. I feel this little jewel is still a bit of a secret that locals keep for themselves. Even though there are lots of people around it never feels as crazy as some other communities along the lake do during the peak of the summer. I packed up the family for the short drive down Hwy. 21 to enjoy all that this happening place has to offer before school starts. Our full day of fun cost me just over $35, which is very reasonable considering all that we did. We started our day at the Clan McGregor Square enjoying the play equipment and the splash pad, which is a recent addition. Many other local families and some visitors were enjoying the shade of the large maple trees while their little ones played on the swings, diggers, and play structure. 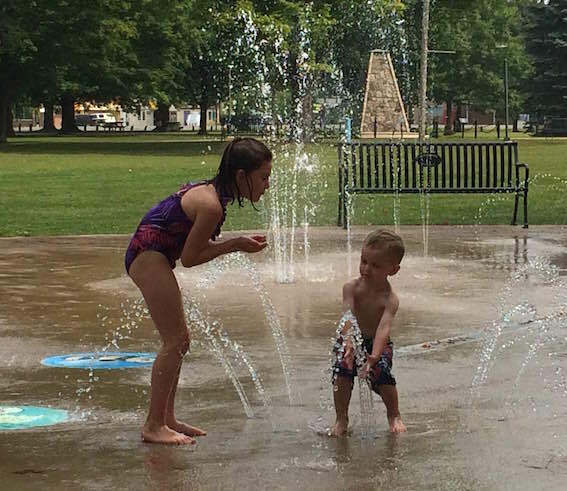 After a quick picnic lunch, we got changed into our bathing suits and cooled down in the splash pad. The water was on the cool side, which was not a bad thing with the heat and humidity being as high as it was. The Square is also the location of the Farmer’s Market every Friday from 3 p.m. to 7 p.m. until October. Once everything was cooled off, we headed down Main Street. There are always some new stores to discover and there were several that caught my eye but they would have to wait until I was childless as my kids were excited for our next stop, the new Huron County Library, to pick out some new books. The library is always a favourite stop for my kiddos (and me too). We are a family that loves to read so to enjoy a few minutes picking out a book in a different library is always a treat. The great thing about having a Huron County library card is that you can take books out from any of the locations and enjoy so much more that they have to offer. Next stop was to check out KryArt Studio. It is the funky barn-style structure located right beside the Little Inn that looks like it has been splattered in paint…because it has! We were checking into some possible art classes for my children and we discovered they offer drop in for kids (ages 5 and up) from 10 a.m. to 11:45 a.m. Mondays to Saturdays at a cost of $30 with materials and a professional artist that will mentor the students. My husband and I made note of this for next summer along with their week long summer camps for kids. Information is available on its website. We crossed the street and headed back towards our van. 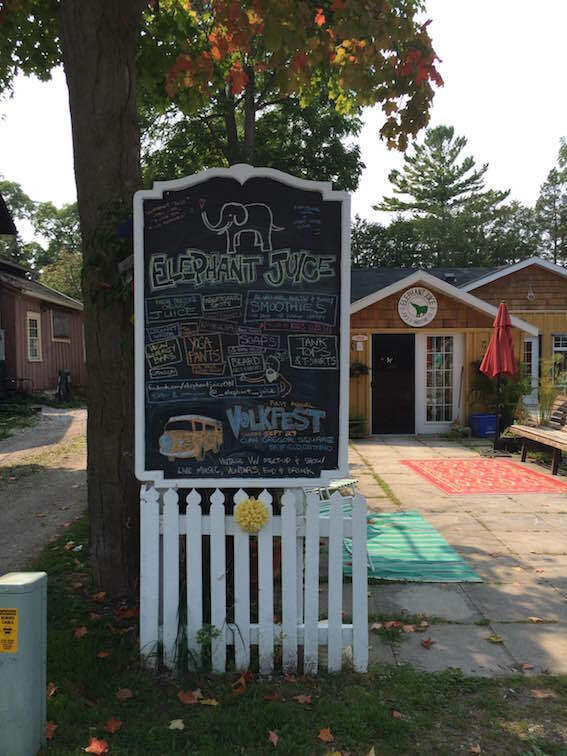 One last stop before we left was at Elephant Juice. This cool little juice and smoothie shop is so much more than just that. They had soaps, health products and really cool looking yoga pants and tops. As the kids were still pretty full from lunch we grabbed a kid-sized smoothie for them to share while we walked back to the van. It was gone pretty quick so plan on buying more than you need as I know the juice will last a few days in your fridge at home. Check out its website or on Facebook. Next stop, a round of mini-putt at Gold Coast Landscaping. I know…mini-putt at a landscaping and garden centre?! This newly renovated 18-hole course is perfect for families and we had oodles of fun. The cost was low as they have a family rate of $20 for up to five people. We had lots of laughs as we discovered our kids are the biggest cheaters! We will definitely have to keep an eye on the scorecard next time as I am sure they did not get that many holes-in-one! Check out its hours online. Last stop before we headed home was a standard stop for locals and tourist alike. The Woodlands Drive-In located right by the water tower for some soft-serve cones. It was hard to only get some ice cream when the smell of deep fried anything wafted the air. It was great to see that they serve local Metzger’s burgers now. Check out its Facebook page for specials. The kids were tuckered out (and so were we) by the end of the day but we plan on hitting up Bayfield more often in the summer and spend some quality date time at many of the restaurants and pubs that Bayfield has.